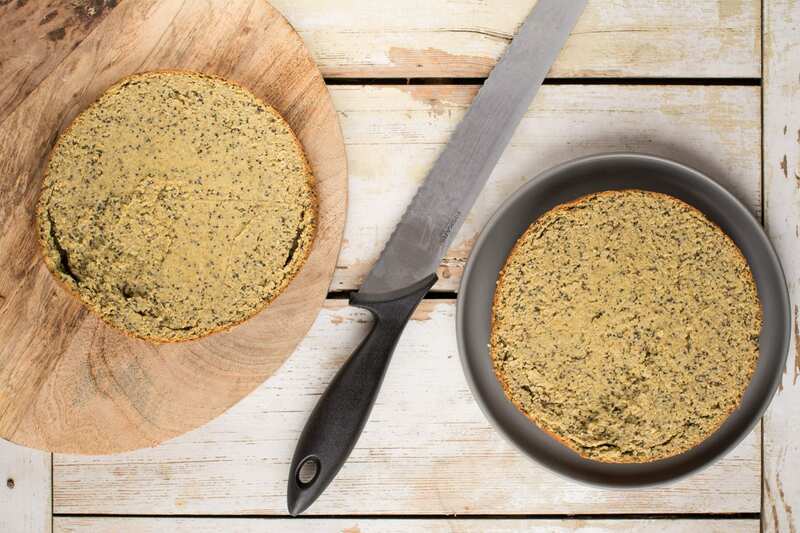 Here’s an easy recipe for gluten-free vegan lemon cake with poppy seeds. It comes with chocolate frosting and tons of healthy legumes and veggies hidden inside while all the oils and refined sugars are left out. You won’t be able to resist the delicate lemon flavour combined with creamy-dreamy chocolate topping. Why is my vegan lemon cake different? My vegan lemon cake is in no way conventional. For starters, it’s healthy! And what makes it healthy? I use no oils or refined sugars in my recipe, which makes it relatively low in fat and blood sugar friendly. 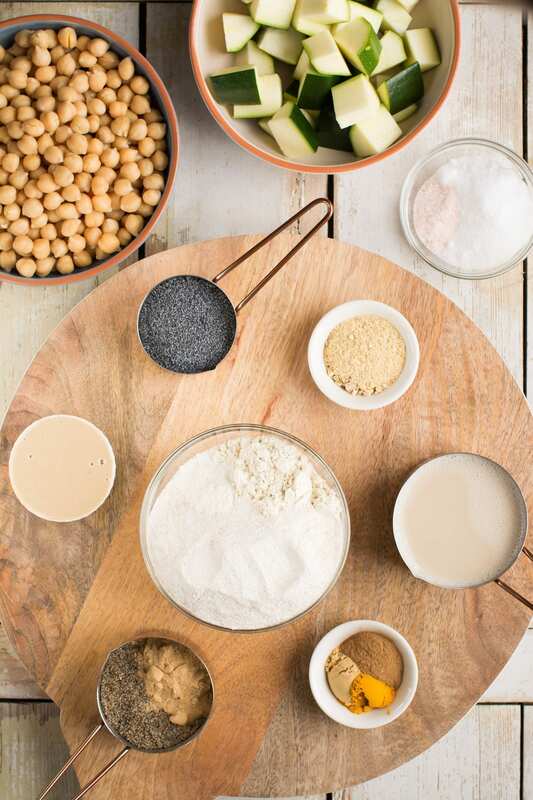 Furthermore, I tried to make its’ grain content as low as possible – the recipe only has a bit of gluten-free buckwheat flour added, other than that it’s all legumes, veggies and fat-reduced nut flours. 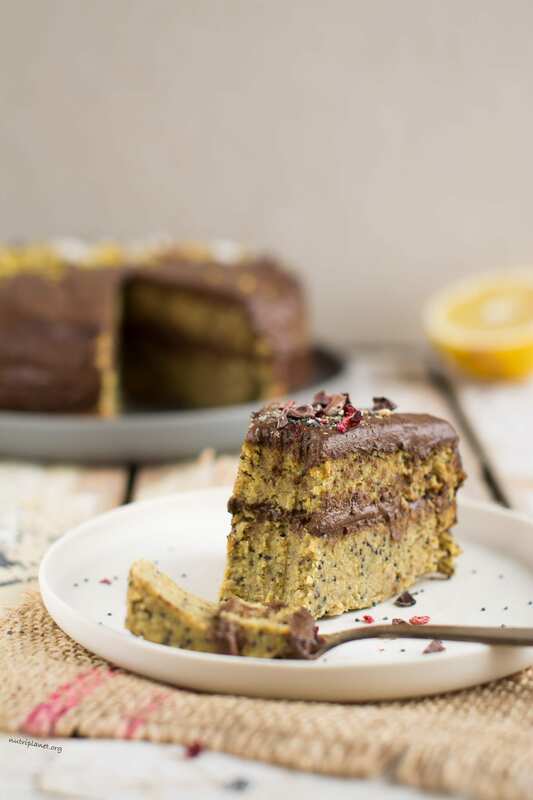 Despite being oil-free, my vegan lemon cake absolutely does not lack of heartiness – chickpeas, tahini, chia seeds and nut flours all contribute to an excellent outcome. While the calories only differ by 67%, i.e. 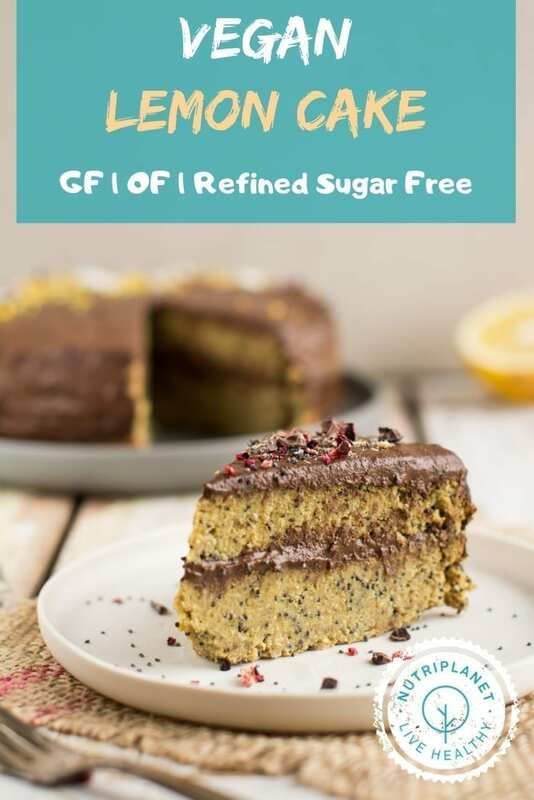 the conventional cake has 67% more calories (which is still quite significant though), the fibre content and GL points of a conventional vegan lemon cake are outrageous! Honestly, my jaw fell to the floor when I finished calculating the glycemic load points. Not so surprising though, when you consider the non-existent fibre content. For your information – it is not recommended to get over 20 GL points at one mealtime to keep your blood sugar stable. And you’d be getting twice as much! No wonder, people suffer from type 2 diabetes and obesity. Here are the ingredients laid out for you! It’s a bit funny how this lemon cake recipe was brought to life. As it happens, this cake started off as an apple cake instead. Now, how’s that possible? I wanted to create a new blondie recipe using less grain flours and experimented with cauliflower. Other than that, the base recipe was quite similar to what you see below. Next, I topped it with apple slices and glazed the apples with nut butter spread – delicious as hell! However, one day (still improving the recipe) I had run out of apples. So, I decided to top the cake with chocolate chips and cocoa nibs instead – oh my, I liked the result! Next time I had a feeling that lemony taste would be perfect to add to the batter and that it’d be fun to try using raw summer squash instead of cauliflower. Jackpot! My hubby and kid were over the moon and suggested to stick to chocolate frosting (and not go for the traditional light coloured cream) when I started to contemplate on how to make this cake presentable. 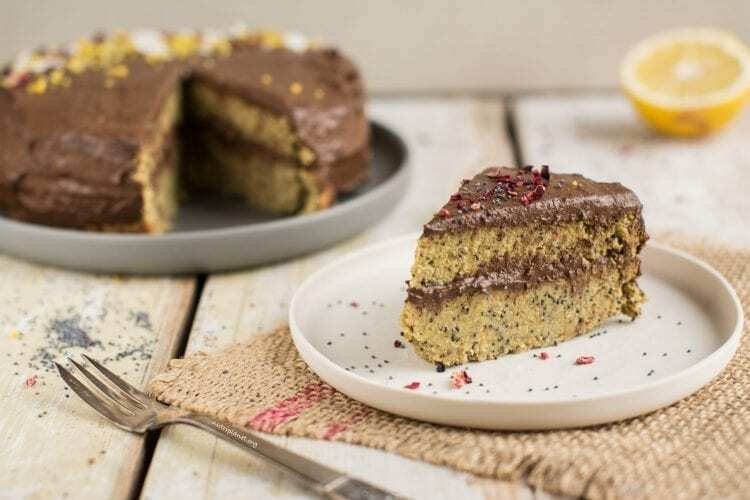 So, here you have it – an apple cake turned into vegan lemon cake with poppy seeds and chocolate frosting 🙂 I’m determined to make this apple cake happen in the near future as well! It has heavenly lemon flavour. Almost reminds me of cheesecake. Hidden legumes and veggies make it so healthy. You don’t even need baking powder to make it. Is this cake healthy or what?! I guess I don’t know how to make an unhealthy cake any more 🙂 It’s amazing to think that only 7 years ago I had no idea how to make a healthy cake or what healthy even was – I’m so grateful to have an open mind and curiosity that allows me to develop my skills as well as continually grow my knowledge and personality. Start with rinsing and draining the chickpeas really well. Then, blend them with raw summer squash, oat milk, tahini, salt and sweetener into a smooth batter. Next, add ground chia seeds and mesquite and process again. You may use either blender or immersion blender. In a large bowl mix together all the dry ingredients – use a fork to separate any chunks of flour. Then, pour the wet mixture over dry and mix until well incorporated (in the video I add dry ingredients to the wet mixture, but it is actually easier the other way around). Line the bottom of a 15cm (5.9inch) round cake tin with parchment paper and grease the sides with coconut oil, avocado oil or olive oil. Transfer the batter into cake tin and spread it out evenly using a spatula or spoon. Bake for 55 minutes to 1 hour and let cool completely before slicing or cutting the cake into half (for frosting). You can also keep it in fridge overnight before serving and/or decorating. If you want your lemon cake baked and cooled faster and don’t care for the round shape, transfer the batter onto baking sheet lined with parchment paper and form about 17x17cm (6.8 inch) square or similar size rectangle (use a spatula). Bake for 40 minutes and let cool. Nutritional info per serving (without frosting): 148 kcal, 14.7g carbohydrates (60.8% of kcal), 5.42g fats (32.9% of kcal), 6.73g protein (18.2% of kcal), 6.82g fibre, 80.1mg sodium, and 7.2 GL points. Nutritional info per serving (without frosting, Plantricious version): 156 kcal, 16g carbohydrates (61.4% of kcal), 5.57g fats (32.2% of kcal), 6.88g protein (17.7% of kcal), 6.85g fibre, 80.5mg sodium, and 10.3 GL points. Make half of my Vegan Chocolate Frosting recipe. Then cut the cake into half and add about two heaped tablespoons of frosting onto the bottom layer. Then, place the other cake layer on top of the frosted bottom layer. Now, spread the reminder of frosting (about 3-4 tablespoons) on top and on the edges of the cake. Let it set in fridge for at least half an hour before slicing. Nutritional info per serving (with chocolate frosting): 222 kcal, 30.7g carbohydrates (44.3% of kcal), 9.97g fats (40.5% of kcal), 8.43g protein (15.2% of kcal), 9.89g fibre, 113mg sodium, and 9.5 GL points. Alternatively, use my cream cheese frosting. You may use any light coloured beans instead of chickpeas. Oat milk can be substituted with additive-free almond milk, rice milk or soymilk. If you use naturally not sweet milks (almond and soy), add more of sweetener to the recipe. As far as the sweeteners are concerned, I like to use a combination of xylitol or stevia – 2 tablespoons of xylitol and 18 drops of liquid stevia. Feel free to use any healthier sweeteners, if you don’t struggle with Candida overgrowth and/or unstable blood sugar. Besides date sugar, you could also go for coconut palm sugar or raw cane sugar. You can use any nut or seed butter instead of tahini, e.g. almond butter, peanut butter, sunflower seed butter. Avoid dark coloured butters like pumpkin seed butter. Don’t buy ready ground chia seeds, but grind them yourself and store in airtight container in fridge. Mesquite flour has caramel taste and can be substituted with lucuma powder, yakon powder or monk fruit powder. If you want to use fresh lemon peel, then add ¼ cup to the cake batter. As far as the nut flours (coconut and fat-reduced almond) go, I haven’t tried with other combinations or different flours. So, I cannot make an adequate suggestion. However, raw buckwheat flour can be substituted with other gluten-free flours, i.e. teff flour or oat flour. If you’re not gluten-intolerant, feel free to use spelt flour. Don’t worry, you absolutely cannot taste turmeric in this lemon cake – it’s there for a bit deeper yellow colour. Thus, you could also leave it out without compromising on taste or texture. 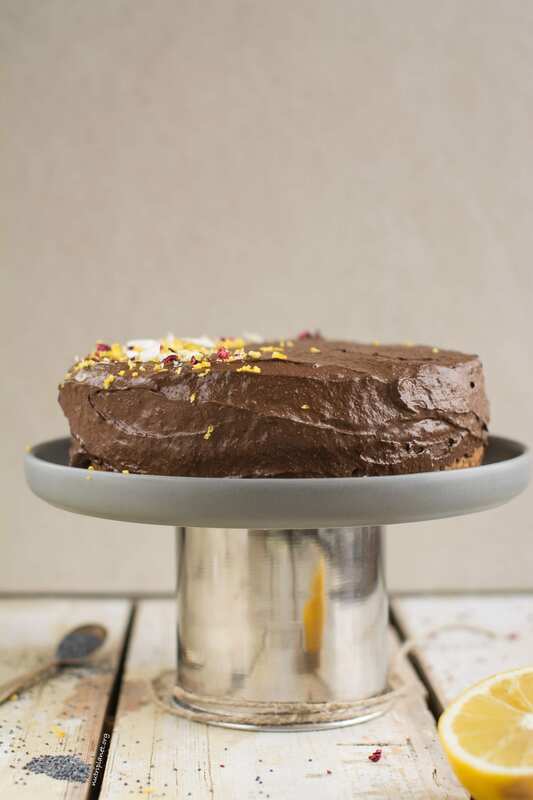 Finally, as the baking times differ a lot, choose to make the square version (with dark chocolate chips and cocoa nibs on top) for daily treat and the round cake with frosting for festive occasions.